There are a few people you can expect to find in every small town. An old adage claims every small town has its own madman, but it also has its own cobbler, its own tailor, its own banana vendor, another who sells boiled eggs and, sometimes, suspicious samosas. Everybody knows the woman who stocks cereals next to the maize mill, where a rather rough looking man routinely spanks the machine to get those last grains of flour out. The sounds of the spanks echo above the permanent hum of the mill, and become integrated into the aural ecosystem of the market. It sounds like music to those who work there every waking day except for Saturday or Sunday, when they report to their respective house of worship. Every small town, as it evolves from a ramshackle unit of buildings cobbled together partially by fate and partially by population growth, breeds certain roles that seem to be filled by the same individuals forever. In the small town I grew up in, that man was a man who sold trees for a living. He must have set up base decades before I was even an idea because he was already old. He was always seated, in a white repurposed lab coat, sporting a beard that had once grown wild but was now tamed by constant visits to a rather unimaginative barber. But he only seemed to move once a year, the man who sold trees, and everytime I saw him he was seated, as if he, like his trees, had taken root in the ground, surrounded by nothing but greenness packed in small black paper bags, itching to find a new hole in the ground to live and die in. In a town where everything was mobile, in an ownership sense, running a tree business was probably the safest business of them all. One congregation had risen early one Sunday to find the entire gate to the House of the Lord had found a new owner in the deep of the night. One time a woman complained that the miller had not spanked the mill for her flour, and when he begrudgingly did, half a kilo of flour stuck inside quickly found its way out. The local mugithi man, an old man sporting the stereotypical costume of a time-travelling mugithi musician, had a small string tied from his belt to the guitar, so it didn’t change ownership when he eventually got drunk and fell asleep. But no one cared about trees. Except the man who sold them and those, like my father, who listened to Wangari Maathai’s gospel. So the trees were unprotected when the man closed shop, figuratively, every night. He would come back to find nothing much had happened in the night to his trees. Except the time a drunk man fell on the trees in the deep of the night and after a few unsuccessful attempts to get up, accepted the embrace of the young trees and slept as if he was in his own bed. One day many years ago, the man who sold trees won a lottery, much like the ongoing Lotto. He didn’t shout about it, nor did we find new wheels packed outside his green empire. He was still in his repurposed lab coat and gumboots the Monday after he won, and still negotiating with clients. We didn’t find new trees with splashy leaves and bling on their young branches. There were no gold chains, no sudden purchases or even a change in business. In fact, the only reason we know Lady Luck had smiled upon the man who made a living off his green thumb is because of a small image that made it to a national newspaper. It was him and his wife, and on the other side the manager of the lottery handing them a huge dummy cheque screaming a seven-figure payday. Nothing seemed to change for the man who sold trees, who, by my last visit to my parents months ago, still sells trees. But there’s something about Lady Luck smiling upon you that you cant hide. Its a certain glow of a lucky streak, maybe its that you smile more, or your eyes betray you. For the man who sold trees, it was that he seemed to have more energy. That once in a while, more than before, he was to be seen walking around his green empire, which had grown about ten nondescript rows. A month after the rains came to his bank account, I saw him do a jig while conversing heartily with a customer. A dance with lady luck had broken his ice. For years before that, I thought of lotteries as a form of gambling, which by design they are, and nothing more than that. But seeing the man with the green thumb move on with his life, almost as if his bank balance had not suddenly ballooned, was a lesson. You play the odds and you cross your fingers and wait for fortune but you can never be ready for that flood. It wasn’t a lesson in courage or sacrifice or commitment, it was a lesson in seeing beyond the luck that winning a lottery can bring. That since, into every life some rain must fall, sometimes the floods of fortune are so strong that your bank account needs years to recover from the shock. And so do you. So you take Lady Luck out for a dance in the rain she brings, quietly, and you hold her waist and follow the music. There’s the Lotto going on. 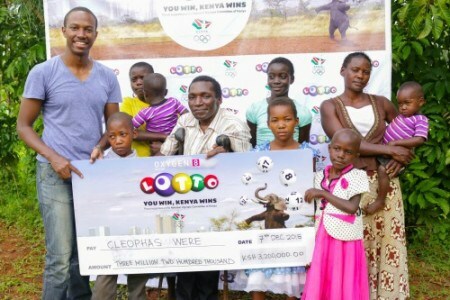 The last man to win a hefty payday, Cleophas Pedha, is a disabled man who, instead of using the opportunity to pry through his wife’s text messages, decided to use her credit to play the Lotto. He won. A payday of KShs. 3.2 million bob! Do you know what you can do with 3.2 million you weren’t expecting? That’s of course when its earned as opposed to obtained through tendrepreneurial ways. Cleophas and his family. Six? Seven children? You could, of course, because you are Kenyan, buy some land and build a house. You could finish your incomplete house, or apartment building. You could get a car, of course, or invest in shares and government bonds. You could drink it all of course, that is within the realm of possibility, but I am assuming we are talking about not urinating 3.2 million bob down a shady bars stinking toilet. Cleophas and his wife have six kids, meaning he had a lot of help propping up the hefty dummy paycheck. He plans to build his family a house, save up for his kids education, and expand his business. He also toyed with a few ideas on how to improve the health condition in his home village in Siaya, because in a proper African community, when one person wins, everyone wins. To play the Lotto, jump to the end of this piece. Lotto has two draws every week, Wednesday at 2100hrs and Saturday at the same time, aired on KTN at 10pm. Each entry costs KShs. 50, and you can learn more about the Lotto here [Link]. May the odds be ever in your favor. Choose the LIPA NA MPESA option from the MPESA menu and send at least KSh 50 to Paybill Business Number 777000, with account number SHINDA to receive your lucky numbers. To play ONLINE: Go to the Lotto website [Link]?www.mylotto.co.ke/shinda, register and pick you numbers.